Home » Work » Beautiful Sunday # 63 - Rush! Rush! Rush! If I could give a theme for the past week, that would be it. I was always in the brink of rushing things. Office work was fine except for some surprises, which I can't yet disclose. Otherwise, my big boss might fire me ;) Teaching was the one that demanded more of the my time and energy. Lectures to review and prepare, added to it the pile of papers that is beginning to accumulate. Hopefully, I'll be a better time manager this week. I cannot afford to survive another sleepless week. It's been almost a month since the classes started and by this time, I should already be adjusted. Surprise early morning meeting with my Big Boss and an external partner! Still about work but this made me happy because things are doing great with our office's little and hidden project. The Big Boss tapped me to join an early morning meeting away from the workplace. It was an unusual route for me and as a result, I was late. Yes, it was a lousy mistake on my part. Despite of this, I was happy because external partner was very cooperative and supportive. Hopefully, the remaining phases of the project will do well. I discovered that Nestle Magnolia is offering Pistachio ice cream in their famous drumstick. Flavorful pistachio, nuts over a sugar cone, who can beat that over a hot weekday afterrnoon? NYFD's huge cut fries with dips (I blogged about it here) and a healthy partner of fresh buko juice. Is this what we call as balanced diet? Haha A dose of junk food and a fresh juice to balance everything. My current read is another paperback from Jane Green. I have an e-book version of this book. But I realized that e-book reading is not really for me. The text in my Android phone makes me feel sleepy. If I use the iPad, I ended up distracted with the surge of a fast wifi connection. I still prefer the feel of a real paperback. May the dream within your heart always guide and inspire you! Indeed and I needed this reminder. I'm with you Diane in liking the feel of a paperback for reading books. Am glad you feel challenged and excited about your work. Happy Sunday D!!! 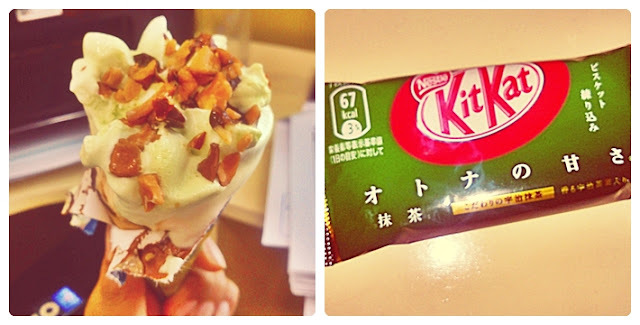 Love KitKat green tea din, masarap din ung royce green tea. Uyy excited ako sa surprise mo,,, im happy for you D! God bless. Mwah!!! Oh, a big secret to share someday! That pistachio drumstick ice cream sounds delish. Your job sounds stressful! But you are taking it in stride -- kudos :) And I'm sure all your hard work will be recognised. I have a weakness for fries, too. They are such great comfort food, aren't they. And that's a cute KitKat bench! Did you have to keep that off your desk, too? Happy Sunday! I just read a book by this author. It was about a young family and a little hard for me to relate to but I like her style of writing! Sweet hugs! Happy Sunday! First time participant! Thanks Diane! That green tea Kitkat is so maarte.. It's hard to find even in Japan daw, my mom said it's not available in all stores. Hahaha. There you go with the food again, lol. Yum! Remember that one of these days soon, all your efforts will be rewarded. Is that a Kitkat Bench?